The design is different from the design of the plugs and other elements. I don’t like the idea of having different looking electrical components. 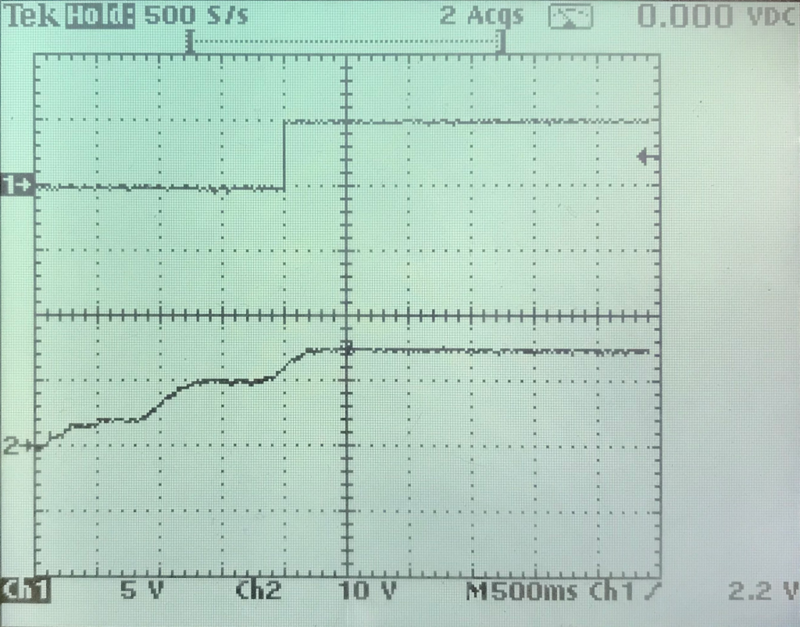 There is no possibility for a backup solution that allows to control light independent of the miniserver. 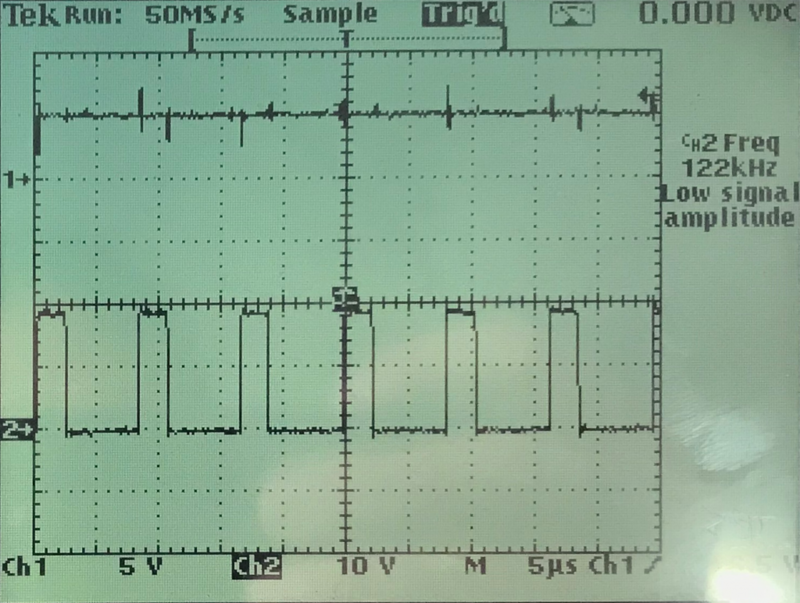 So I’ve chosen Taster 10 AX 250 V ~ (531 U) (I’ll call it “1” from now on) and Tastsensor-Modul 24 V AC/DC, 20 mA (A 5236 TSM) (I’ll call it “6” from now on, and the switch in the upper left will be called 6_1, the upper right 6_2 and so on …) from the company Jung. The idea is to control the main light of each room with 1. 6_1 (up) and 6_2 (down) will be used for the roller blinds. 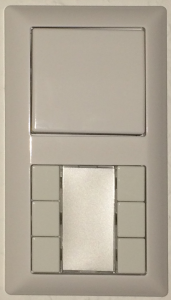 The four remaining switches can be used differently in all rooms dependent on the needs. But, and there’s always a but, a CAT cable only contains 8 wires. Even though it’d be enough for 7 push buttons there is no wire left for the 6 red feedback LEDs and the RGB LED. Connecting all that would require 3 CAT cables. That’s a price and effort I’m not willing to pay. It’d also mean that the miniserver has to provide 16 in/outputs for each room. This is what would make it really expensive. 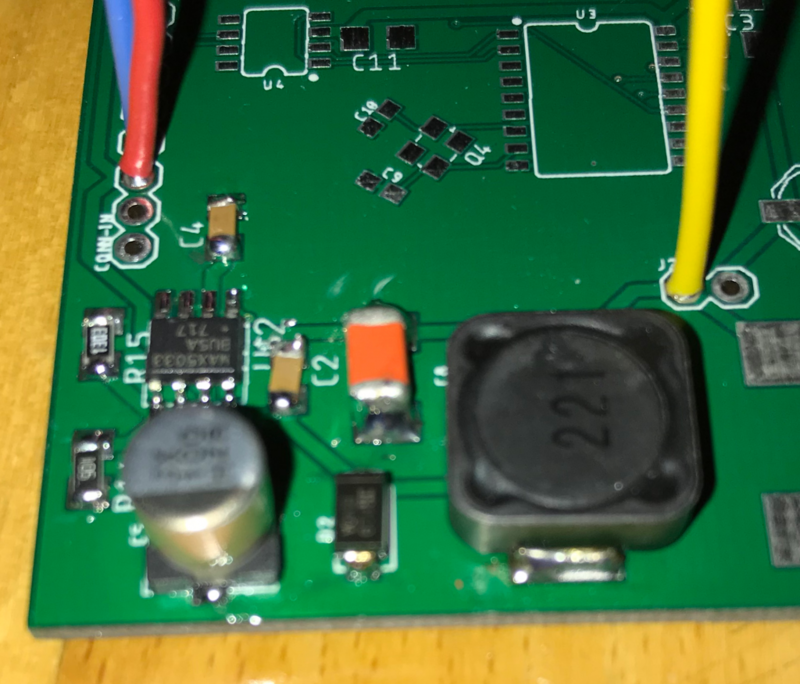 So I’ve decided to spend more of my time and come up with a solution that allows to connect my switch setup to the miniserver and to the backup circuitry at the same time while requiring only 1 CAT cable per switch. Starting point of home automation is the signal and power cables routed to the switch cabinet in the basement. The additional cost and effort is the signal cables that would not be required in a traditional setup. The additional effort for the power lines can be neglected since the additional length from each room to the basement is compensated by less cable in the rooms for example from a switch for the roller blinds to the motor of the roller blind. On the left you can see the power cables that go to the lights, plugs and roller blinds. The red cables are the connections to the smoke detectors. Each room that is either a potential sleeping room or that is part of the escape path has a smoke detector (required by law). 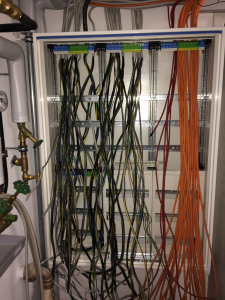 Additionally to the mandatory requirements they are connected on floor level and the floors are connected in the switch cabinet. In addition there is a connection between the three parts of the house. Currently they are all hard wired together. This might change in future to suppress the forwarding of alarms for some time. E.g. when testing smoke detectors in one part of the house it’s not desired to trigger all other smoke detectors. As you can see there is still much space left in the switch cabinet, and that can’t be filled up only by simple fuses. Nowadays, on floors that are partially constructed with wood, you’ve to install special fuses with spark detection . Those are 3 times the size of the traditional ones. There will be the fault current protection switches that are nowadays mandatory for all three phases and not only for the bathroom. There is my backup circuitry, that makes sure that, even without the home automation system, in each room the light can be switched and the roller blinds can be moved. There will be a power supply for the backup system as well as for the home automation system. And last but not least there will be the home automation system itself.